The Cerebral Palsy Research Network (CPRN), owner of MyCerebralPalsy.org, launched a study of adults with CP this past week. There are no studies that provide a comprehensive understanding of the affects of aging with CP from the perspective of the population of people with CP. The study is open to all adults (18 years or older) signed up for MyCP after completing the consent on the https://mycerebralpalsy.org/surveys page. The study begins with a series of questions about health and well being, employment status, and function abilities. If participants have had chronic pain, the study offers a series of questions on experiences with pain. Overall, the surveys can be completed in approximately 20 minutes. All of the information is confidential and stored on HIPAA compliant, secure servers at the University of Utah. This study was developed by the CPRN Adult Study Panel — a panel of clinician researchers who treat adults with CP. The group consulted extensively with the CPRN Community Advisory Committee to develop the study concept. CPRN seeks to enroll 500 participants in the study over the next few years. The analysis of this data should reveal significant findings about the adult population with CP compared against the population on the whole. These findings should provide tremendous support for health care planning, insurance and future research studies. This new NIH funded grant is a very important step in taking the relatively new findings from early detection of cerebral palsy to early intervention. Great work has been done by our friend and advisor Dr. Iona Novak, to strengthen the case for early detection of cerebral palsy and these best practices of early detection are in the early stages of being established at sites around the world. But what interventions matter, if a brain injury with a high correlation to cerebral palsy is detected? For one type of cerebral palsy, this study may provide the evidence base for an important answer. Dr. Adam Kirton, a pediatric neurologist from Alberta Children’s Hospital in Canada says “Congenital hemiplegia is the most common form of cerebral palsy in children born at term, and stroke is the number one cause” in article entitled “Cerebral palsy secondary to perinatal ischemic stroke” published in Clinical Perinatology in June 2006. Dr. Ramey and Dr. Lo, the Co-Principal Investigators on this trial called I-AQUIRE, have received significant funding to arrive at the answer to what intervening with therapy can do for these young stroke victims. The Cerebral Palsy Research Network (CPRN) will be hosting a webinar to provide an update on Research CP this evening, Tuesday, March 26 at 7 pm ET. 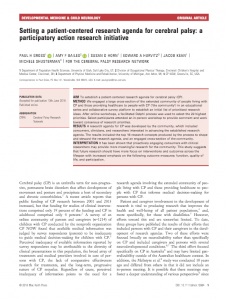 The webinar will provide a brief overview of the Research CP initiative and a bit more detail on the workshop results but we recommend that participants read the published paper prior to attending or watching the webinar recording. The webinar will then focus on the accomplishments since the completion of the Research CP workshop in June of 2017 including dissemination of the results and new research efforts that have been started as a result. We will officially launch MyCerebralPalsy.org (MyCP) as part of the webinar. Thanks for all your help in testing MyCP. We hope to significantly build the community of participants from this point forward including discussions about research, further priority setting and building the CPRN Community Registry for expanded research into the impact of CP on people’s lives. If you want to join the webinar and you haven’t already signed up, please sign up here. MyCP is a patient powered registry for cerebral palsy that is part of the Cerebral Palsy Research Network (CPRN). Let’s tease that apart. First, it is a registry or a database of people with cerebral palsy or their caregivers. Registries are important tools for conducting research. MyCP is focused on patient-reported outcomes — as opposed to the outcomes that doctors record clinically after an intervention like surgery or medication. But MyCP will also connect people with CP to researchers if they want to be considered for involvement in studies. Your information is private and it is only released to researchers if you agree to release it. Want to learn more? Stay tuned by signing up for our email alerts.